It was fun flirting with playoffs for two months, but the fact the Sox only have two starting pitchers worth a damn and were relying on Hector Noesi and Andre Rienzo to pitch important innings was going to catch up to them at some point. It seems we’ve reached that point. And that means that the Sox will likely be sellers next month when the deadline approaches, and this “rebuild” of their will move on to the next step. And that next step could include another team doing the Sox a favor and relieving them of some salary. Joel Sherman of the New York Post wrote a column about the Yankees needing pitching help — which they really, really do — and the premise was mostly that the Yankees don’t have the prospects to pry away the big names on the market like David Price or Jeff Samardzija. Instead they’ll have to shop the bargain bin, and that’s where John Danks’ name popped up. 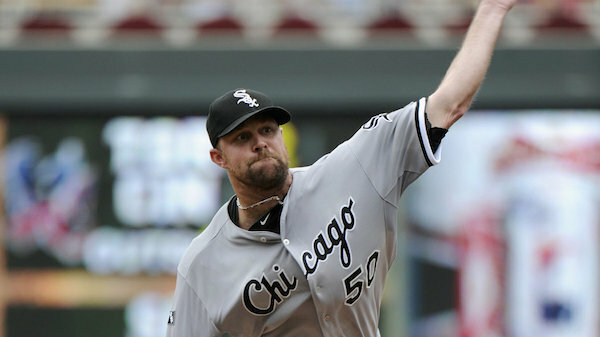 Therefore, unless someone such as Cincinnati’s Mat Latos or San Diego’s Andrew Cashner becomes available, the Yankees might have to shoot lower for pitchers such as the White Sox’s John Danks, the Cubs’ Jason Hammel or the Padres’ Ian Kennedy. Yes, Jason Hammel is mentioned as well, but that’s not nearly as big a deal seeing as that Hammel was signed to trade in the first place. But this is really the first time I’ve heard Danks be mentioned as somebody a team should consider. Now, just to be clear, there is no actual Yankees interest in John Danks that we know of, this is just Sherman kicking some possibilities around. I just know that it’s a possibility I like. Before Sunday’s start against the Twins there had been talk that John Danks had finally figured things out in his post-injury career, but, well, then Sunday’s start happened and suddenly things weren’t so simple anymore. But even if John Danks is “fixed” I’d be more than all right with the idea of the Sox moving him in a trade, even if the returns are somewhat limited. John Danks is making $14.25 million this year and is scheduled to make $28.5 million over the next two seasons. That’s a lot of money for a pitcher that’s been worth 1.9 WAR since his big money extension kicked in last season. That’s also a lot of money that the White Sox could free up to move forward. Would you rather the Sox spend $28.5 million on John Danks the next two years or put that money to use on the free agent market? Maybe that money can go toward signing a Justin Masterson, a James Shields or a Jon Lester. Considering that Adam Dunn’s contract comes off the books after the season as well, the Sox will have plenty of new money available to make a run at a free agent starter this winter if desired. Maybe even Max Scherzer (they won’t but let’s dream). Now I don’t think the odds of the Yankees — or anybody really — being interested in Danks are great, at least not without the White Sox eating some of that remaining money. Were Danks in the final year of his deal I think it’d be easy to trade him, but he isn’t, and these aren’t the old Yankees that would consider spending $30 million on a mediocre pitcher to be like shopping at the dollar store. God I miss those Yankees. Not nearly as much as I miss the John Danks that was worth his contract extension at the time, but enough. This entry was posted in Chicago White Sox and tagged Adam Dunn, Andre Rienzo, David Price, Hector Noesi, Jason Hammel, Jeff Samardzija, John Danks, Trade Rumors by Tom Fornelli. Bookmark the permalink.